Carpet Beetles are approx 2-4mm in length, have a rounded body, and usually a irregular pattern of brown, white and black markings. Carpet beetle larvae are known as 'woolly bears' as they have have tufts of hair along their body. 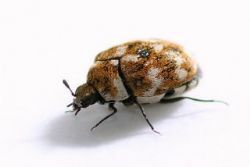 Carpet Beetle larvae will feed on natural fibres found in most homes, so items like clothes, carpets and soft furnishings may be in danger if a Carpet Beetle infestation arises. Generally they occur naturally outdoors but may make their way indoors looking for food and warmth. Infestations can quickly arise and can be very problematic to deal with without the correct products. Not unlike other pests, such as Carpet and Clothes Moths, the main damage occurs during the larval stage, when the larvae feed on organic material and natural fibres including woollen carpets, furniture, clothing and even on the felt of musical instruments. As the behaviour and feeding habits are very similar to other textile pests it can be sometimes difficult to identify what you’re dealing with. However, Carpet Beetles will feed in a single area leaving a large bare patch, whereas Carpet Moths will usually eat smaller areas scattered around the carpet edges and under furniture. You may also find shed larval cases in dark areas and find the adult beetles near windows. The shed hairs can sometimes cause itchy welts on the skin that resemble a bed bug or flea bite. Carpet Beetle infestations can often be introduced into the home through birds nests in or around your property. Successful control of a Carpet Beetle infestation can be achieved with the use of appropriate insecticides. Products such as Pest Expert Formula 'C' Spray and Formula 'P' Carpet Moth & Beetle Powder are essential for complete eradication. These insecticides are highly effective and, if used correctly, can leave residual protection against future infestations. Keeping your house clean and tidy removing any unnecessary food sources is also beneficial. Carpet Beetles can be attracted by any organic matter including flowers, pet food and even hair and paint brushes which have natural bristles. Good housekeeping is imperative to prevent infestations re-occurring. Thorough and regular vacuuming of carpets, rugs and other places that could be harbouring eggs and larvae is vital. However, the use of products and insecticides that leave residual protection will give you the best possible protection against another infestation arising.